How to Calculate Long Exposures in Night Photography? If we are accustomed to taking our photos of the day or at least in places duly lit, probably we never used exposure times slower than a few seconds. But when we are in night photography, the low amount of available light is not comparable with any of the situations more “normal” in which we found to be photographed. We will in fact have to use shutter speeds equal to several seconds if not minutes. As we saw in the article Digital Photography and Night Shots, a first approach to calculate exposure is a time consuming way; is by going with trial and error. The measurement of exposure by the camera may not be accurate in such extreme situations; therefore, at the beginning, it might be an idea to try with the suggested time from the camera an, if that does not satisfy us, we need to increase or decrease the shutter speed by one stop, repeating until we get the photo you want. Mayer, J. 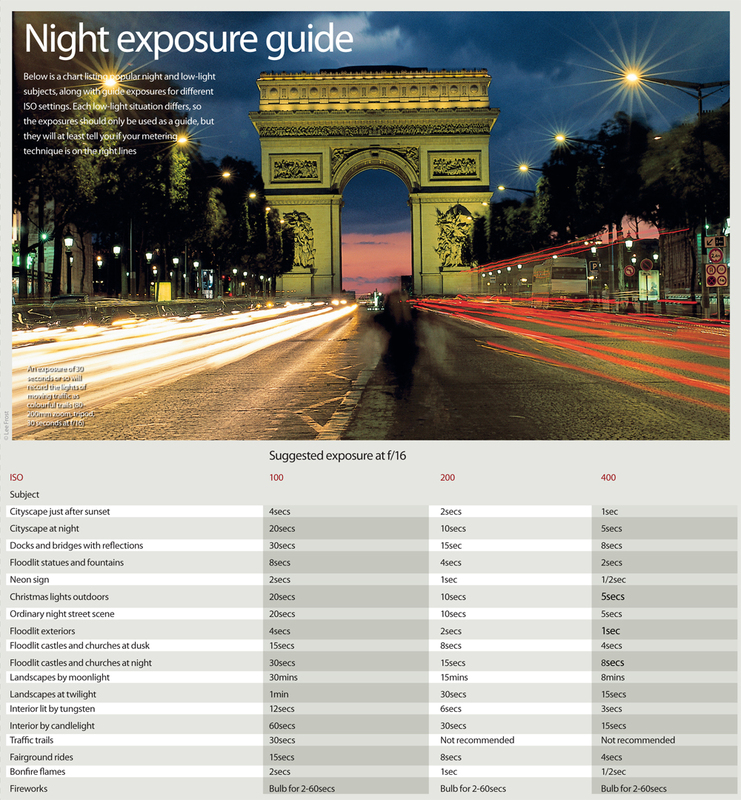 Long Exposures in Night Photography Cheatsheet. Digital image. DigitalCameraWorld. DigitalCameraWorld, 27 Nov. 2012. Web. 5 Dec. 2014.http://www.digitalcameraworld.com/2012/11/27/night-photography-exposure-guide-free-cheat-sheet/. However, in some cases we soon realize that the camera will not be able to suggest an exposure time. These are the situations in which the available light is extremely low; such as in the case of a night landscape totally devoid of artificial lighting and without moonlight. Similar conditions may result in an exposure time greater than the maximum supported by the camera. Trying to reduce the time of exposure mode to Shutter-priority (S symbol shown on the Nikon and Canon on the symbol TV) to 30 seconds is the minimum value beyond which the exposure time can not be set (may vary depending on the model). In these cases, we have to resort to the bulb mode. The operation of the bulb mode is simple – when we press the shutter button the shutter opens and stays open until you press the shutter button again or until a time limit which in many cases is set to 30 minutes. To activate the bulb mode, we put the camera in manual mode and lower the exposure time up to the maximum allowed value (e.g. 30 seconds). Adjusting the ring will bring us the shot precisely in bulb mode. The hard part, of course, is to calculate the correct exposure time, as we will have to close the shutter when this time has elapsed. There is fortunately a technique that allows you to get help from the camera in this calculation. This Article Has Been Shared 7642 Times! Cite this article as: Abhishek Ghosh, "How to Calculate Long Exposures in Night Photography," in The Customize Windows, February 10, 2014, April 25, 2019, https://thecustomizewindows.com/2014/02/how-to-calculate-long-exposures-in-night-photography/.